What a splendid day we all had! By joining forces with Victoria Travel, we were able to secure the New Orleans paddle steamer for our lunch cruise along the River Thames. We were given a welcome drink as we boarded the boat and treated to a fabulous, two-course buffet lunch. The weather was kind to us, which meant we could enjoy the views from the upper deck as we travelled through Marsh & Shiplake locks, admiring the beautiful houses along the route. "Another great day out. Beautiful paddle steamer, great tasty food & the weather was very kind to us. Another must do!? ?” - Doreen & John Tessier. "A big thank you from us both for another really enjoyable outing. The boat and food were first class. Although the sun didn’t shine it was probably in our favour as it meant we could sit out on deck and admire the scenery without fear of roasting! 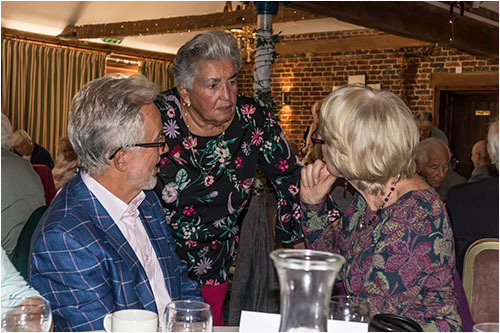 Once again many thanks to you and your team for all the hard work and effort you put into organising the events for us all to enjoy.” - Roger & Jan Patterson. Wonder who has to clean the top of the funnels? Good job the funnels fold down! Nice big windows to watch the world go by! Shame the weather wasn't sunny, but the views were good. All too soon, the cruise ended.